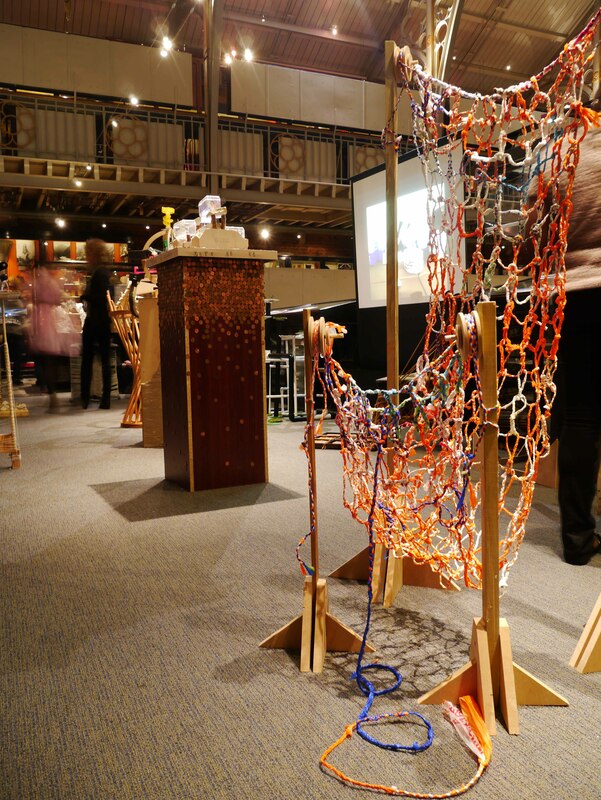 Year one students from Oxford Brookes School of Architecture collaborated with Archeox, the East Oxford Archaeology and History Project, to explore the connections between architecture and archaeology. Traditionally archaeological objects are displayed in glass cases in museums, or in drawers to be taken out by professionals wearing white gloves. 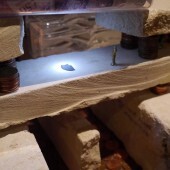 OB1 LIVE challenged these preconceptions and created prototype display devices designed for significant archaeological artefacts found by Archeox at Bartelmas Chapel, Cowley and Minchery Priory near Oxford United’s football ground. The finds reveal important evidence of a leper hospital at Bartelmas Chapel and include prehistoric and medieval finds at Minchery Farm. 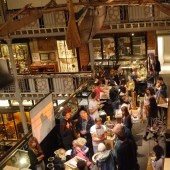 The display device prototypes were installed in a temporary exhibition held at the Pitt Rivers Museum on 19 October 2013. 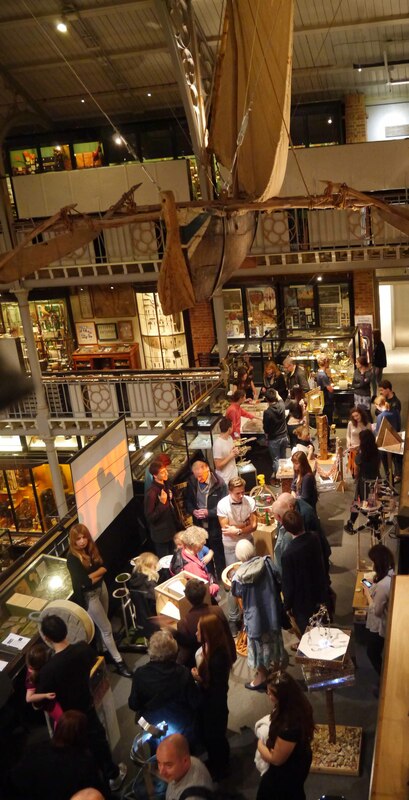 The event was designed to gather visitor feedback on the installations and the overall exhibition to help Archeox by testing ideas for a full exhibition of their finds next year. 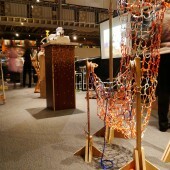 Prototypes included an interactive fishing net construction installation using a medieval bon toggle; a chair to view a C12th floor tile that referenced the absent body and the archaeologist’s excavation grid; and a device to view a Civil War clay pipe that also related historical and contemporary smoking habits in Oxford. What are the disciplinary connections between architecture and archaeology? 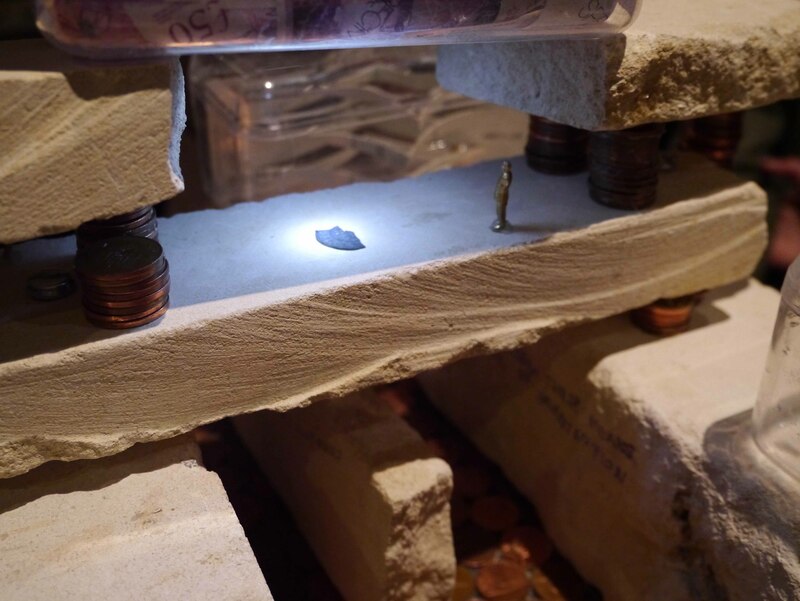 How can found objects be used to curate the stories of archaeological finds? Tutors: Jane Anderson, Rob Houmøller, Orestes Chouchoulas, Merce Rodrigo Garcia, Ruth Cuenca, Neil Kahawatte. Students: Oluwatoyosi Adenuga, Cassandra Adjei, Nicole Akano, Daniel Almeida Carreno, Aslihan Arslan, Florence Atkin, William Audley , Craig Baigent, Samuel Barratt, Abdulmajid Basha, Kaloyan Baychev, Aylin Bayhan, Murad Baylarov, Dexter Benjamin, Jennifer Benton, Chintan Bhundiya, Fatima Bintube, Paul Bisbrown, Caroline Bowen-Long, George Brandon, James Brooks, Freja Brown, Joshua Brown, Michael Buckley, Gabrielle Bucknall, Phillippa Budd, Hannah Burrough, Rebecca Byren, Kirstin Campbell, Efe Chamay, Ben Chaney, Danai Charalampidi, Kieran Chauhan, Stephanie Chivers, Eunbi Choi, Dovile Ciapaite, Jermaine Coley Hines, William Conway-Smith, Emily Courtenay, Adrian Cristian, Marco Da Silva Rosa, Graham Davis, Enrique De La Cueva, Katherine Dechow, Hannah Drake, Emily Dudman, Ilze Dukovska, Isidora Durakic, Imogen Edwards, Sophia Edwards, Lucas Fabbri, Niloufar Fallah Damavandi, William Field, Sophie Flinder, Ioannis Galanos, Harriet Garbutt, Millie Gardiner, Christiana Georghiou, Robert Goacher, Joseph Goldman, Lucy Goldthorpe, Callum Graham, Sophie Grant, Frazer Gray, Faye Greenwood, Jessica Guy, Stefan Haest, Shahad Halawani, Emily Hawkings, Harriet Hawks, Adrian Hong, Alice Howland, Louisa Hunter, Joshua Hyland, Nikolay Ivanov, Konstanca Ivanova, Paige James, Mythilli Jeganathan, Gabriele Juzeliunaite, Sagarika Kaimal, Christina Knoff, Ayumi Konishi, Maria Konstantopoulou, Beril Kubin, Miranta Lafi, Daniela Larbalestier, Lucy Large, Var, Starbo Lind, Kristina Line, Luis Lopez Leon, Jessica Macnally, Conor Maher, Aliaksandr Manko, Minerva Mariotti, Rory Martin, Kwok Mau, Jonah Maxted, Olivia Mcandrew, Amber Mcleggan, Henry Meredith, Holly Mills, Dina Mjaland, Harriet Montague, Ali Morowa, Joy Mulandi, Catriona Musoko, Julie Myck, Olivia Myttion, Kimwa, Namrangwa Rai, Kieran Newell, Andrew Nicholls, Lucy Norton, Christina Odegaard Grytten, Esther Onaolapo, Xheremi Panariti, Mabel Parsons, Robert Pennington, Manu Pillai, Simona Puckovicova, Ingrid Rabo Halvorsen, Haydn Read, Antony Sadler,, Kriselle San Luis, Tariq Shah, Sandra Skjolde, Tomas Skurdauskis, Tayler Spruce, Katie Stares, Annabelle Stillman-Jones, Archie Stroud, Monika Strzyzewska, Agnieszka Szubert, William Thomas, Kara Thompson, Sophie Thompson, Sam Tottenham, Chloe Trevan, Victoria Tucker, Louise Tupas, Teodora Velkova, Arandeep Virdee, Oscar Von Claer, Thomas Walker, Rebecca Waller, Gabrielle Watson, Konrad Weka, Ellie Williams, Joseph Williams, Xiaomeng Wu, Jack Young.